This is such a great way to cook broccoli. I love the addition of the spices and the Parmesan cheese. I love broccoli anyways, but this was fabulous. It totally resembled a pizza flavor. I imagine kids would love it too (but you may want to add less of the chile flakes). And, just so you know, the chile flakes weren’t super spicy/hot, but they added lots of flavor! Here’s to another twist on your regular vegetable side dishes. Enjoy! Break or cut broccoli into bite-sized florets. Steam the broccoli until you can easily insert a knife into the center of the broccoli (about 5 to 6 minutes). Preheat the broiler. Drain the broccoli (and lightly pat dry with a paper towel) and place it on a baking sheet. Drizzle it with the oil, and sprinkle it with chile flakes and oregano. Toss to coat. 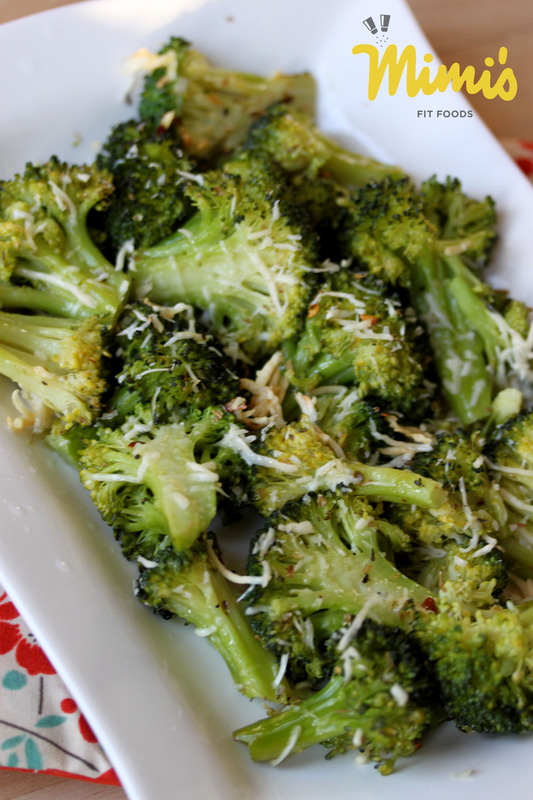 Sprinkle with cheese and broil the broccoli until the cheese is golden brown, 2-3 minutes. Squeeze lemon juice onto the broccoli, season with salt and pepper to taste, and serve. Im curious what the chile does? or is it similar to red pepper flakes? Yes, red pepper flakes are the same.